I was so happy to see them that I couldn’t help drawing curly wingtips. That’s my bit of delight, expressing itself in a departure from verisimilitude. I love this, Deb! It IS that tender, delicate and lyrical promise of Spring arriving. Deb, still enjoying your site to the utmost! Your water colors are neat , especially the Bluebirds. Now I think you should sign these and add a copyright. We have some of Rie Munoz Alaska prints hanging all thru our house., which reminded me of what one can do with the local scenes. She lives in Juneau. Yea! Spring is really coming! I finally saw a big fat robin the other day, along with some other smaller birds that I’m not sure what they are – maybe some sort of chickadee. I also have lots of spring flowers starting to show serious signs of coming back to life! Color showing on the lilac buds, the forsythia in full bloom, and a daffodil here and there. 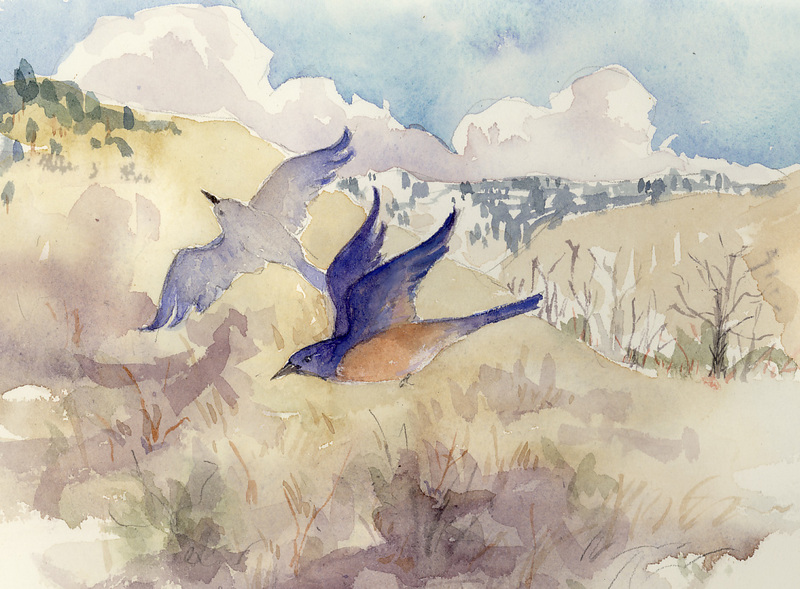 I love your bluebirds – wish you’d screen print it – I’d like a copy! Love you and what you see, do and write about!